If you've been to a classroom lately you understand the need to compete with smartphones which encourage a near-instant reward cycle! 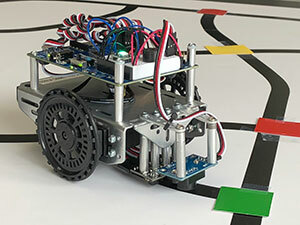 Here's a quick introduction to Blockly using the ActivityBot 360° and a few sensors from their shop. I've also shared a low-cost way of getting started for around $40. I've been particularly close to physical computing in education since my employer (Parallax) has been training teachers and students for 20 years. Programming tools have become more high-level, with libraries and functions making it quicker to have a working project. Get started with your breadboard experiments today! Pocket power never leave home without it! Build a filter to allow a guitar to be plugged directly into your home stereo receiver. Charlieplexing is driving many LEDs with only a few pins of microcontroller.